Tektronix, Inc., a leading supplier of test, measurement, and monitoring products and solutions, has announced new software capabilities for its TLA7SA08 and TLA7SA16 Logic Protocol Analyzer Modules supporting PCI Express (PCIe) 3.0, the next generation PCIe specification. Designed to make PCIe system debug and analysis faster and easier, the new capabilities include an innovative Bird’s Eye View (BEV) to help engineers visualize and investigate difficult flow control problems along with one-click calibration and auto configuration. Featuring double the data rate and improved I/O bandwidth over previous generations, PCIe 3.0 specifications bring new complexity and testing challenges in both the physical and the protocol layers. Further, PCIe is designed to be used in a wide variety of applications, putting pressure on test instruments to track features such as dynamic link width change, dynamic speed change, lane ordering, polarity changes and several power saving modes. With its new capabilities, the Tektronix Logic Protocol Analyzers enable designers to stay abreast of PCIe 3.0 specifications and efficiently bring products to market. Bird’s Eye View offers a completely new way to visualize information to quickly investigate PCI Express flow control problems which can be some of the most challenging issues to debug. Until today, protocol tools were only able to provide views of decoded packet data. The Transaction Window, a single innovative window on the Tektronix Logic Protocol Analyzer, provides views of protocol behavior at the packet and transaction level interspersed with physical layer activity. BEV is a Tektronix innovation that is completly integrated into the transaction window and provides a high level view of the entire acquisition. When a potential problem is seen in the BEV window, the user can quickly navigate to the suspect data using the BEV and immediately identify and isolate the underlying events that are causing the problem by viewing the corresponding data in the transaction window. This new analysis capability is unmatched in the industry. One-Click Calibration combines the Logic Protocol Analyzer’s acquisition hardware and trigger capabilities to exhaustively test hundreds or even thousands of possible instrument settings to automatically determine the optimal set-up that allows the instrument to acquire data without Bit errors. PCIe Personalization allows user to reduce set-up times and quickly start debugging their designs. The software automatically detects a TLA7SAxx module and brings up the PCI Express Protocol Analyzer setup screen and starts an Auto-Configuration process. Once complete, users can begin acquiring data and viewing information in the Listing and Transaction windows that were automatically opened during the acquisition. PCIe Personalization insures that the software displays the right information at the right time allowing users to quickly visualize acquisition data within minutes of setting up the test system. Auto-Configuration automatically configures the operating parameters of the Logic Protocol Analyzer such as link speed, lane ordering and lane polarity based on the PCIe link characteristics. The setup window in combination with the calibration details table provide key indicators about the operating conditions of the system under test in near real time, viewable in a single, easy-to-use screen even before an acquisition is taken. Introduced in April 2010 and achieving the 2011 Test & Measurement “Best in Test Award,” the TLA7SAxx modules have been providing comprehensive test solution for PCI Express 1.0/2.0/3.0. With these new features, user will now have access to enhanced PCIe debug and validation capabilities on the TLA7SAxx modules. 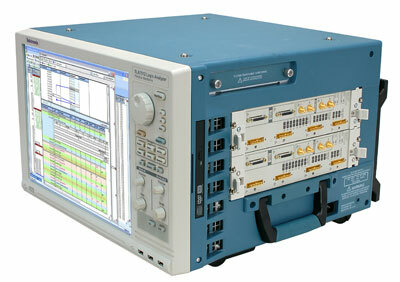 The solution includes 8- or 16- channel Logic Protocol Analyzer modules, bus support software, Slot Interposers, Midbus Probes and exclusive solder-down probes, giving PCIe developers a powerful time-correlated view of system behavior, starting with protocol analysis and working down to the physical layer to debug the root cause of elusive problems. TLA7SA08 and TLA7SA16 Logic Protocol Analyzer Modules and supporting software are available now worldwide.